My ceramic work is characterized by simple but bold surface design, using retro-inspired graphics and a fresh, cheerful color palette. 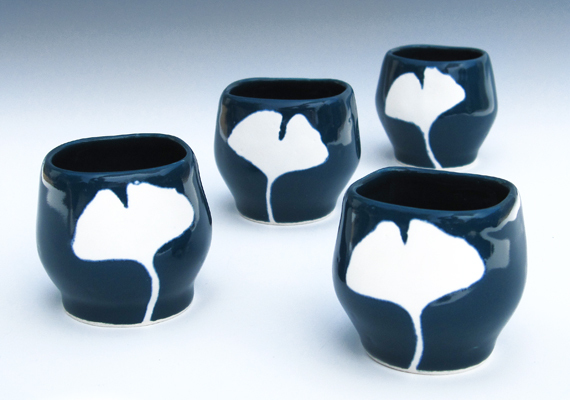 Pieces are hand-shaped with contrasting matte and glossy glaze finishes. My tabletop pieces are equally suited for serving or display, and my ceramic pendant necklaces are unique personal accessories. I embrace the handmade nature of my work by creating each piece entirely by my own hands, with no outsourcing and nothing made from a mold. Pieces are individually shaped by hand from low fire clay, using both wheel-thrown and hand-building methods. My illustrations are pencil-drawn onto bisqueware, and commercial glazes are applied by hand using metal tipped squeeze bottles and brushes. The pieces are then low fired in an electric kiln. I especially love the handmade process and how a ceramic piece transforms through each step, from the initial creative spark of an idea to the exciting reveal when the kiln lid is lifted.